This review was published by Shelf Awareness on July 22, 2015. 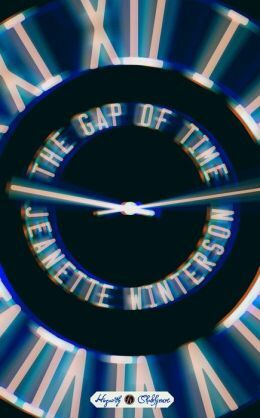 The Hogarth Shakespeare project undertakes to reinvent the Bard’s classic works in novel form; the first installment is The Gap of Time by Jeanette Winterson (Oranges Are Not the Only Fruit; Why Be Happy When You Could Be Normal? ), a “cover version” of The Winter’s Tale. In Shakespeare’s original, the kings of Sicilia and Bohemia are great friends until one accuses the other of sleeping with his wife. The jealous Leontes plots to murder his friend Polixenes, but misses his chance and instead takes out his rage on his pregnant wife, the queen Hermione. By the time his suspicions are proved false, he has lost both his son and his wife, and the baby girl Hermione gives birth to has disappeared. Leontes ordered the baby taken into the wilderness and abandoned, but the man he assigned this task died in the process, so the baby’s fate is unknown. Sixteen years later, a romance between Polixenes’s son and a beautiful, mysterious shepherd’s daughter may offer redemption and even a second chance. The Gap of Time is set dually in modern London, just following the 2008 economic crisis, and the fictional American city of New Bohemia. Londoners Leo and Xeno were childhood friends and, for a time, lovers; as adults, despite very different values, the bohemian Xeno and the materialistic Leo have become business partners in Sicilia, a high-tech gaming company. Leo’s wife, MiMi, son, Milo, and his uber-capable assistant, Pauline, round out a highly functional, loving family of sorts, until Leo becomes obsessed with the idea that MiMi and Xeno are sleeping together. Leo reacts violently, and loses his son and wife. When he tries to ship MiMi’s baby daughter overseas to Xeno, whom he wrongly believes to be her father, the little girl goes missing. In New Bohemia, Shep and his son, Clo, who run a piano bar, come across a carjacking too late to save its victim, after which Shep is able to pull a baby out of the nearby hospital’s BabyHatch, a high-tech receptacle for abandoned infants. He is convinced this child is a gift meant for him, to help him heal after his wife’s death, and raises the girl as his own. Her name, according to papers found with her, is Perdita. He could never conceal from her that she is adopted: Perdita is white, while Shep and Clo are black; but she grows up in a home filled with love and music, never doubting that she is wanted. As in the original, 16 years will pass before Perdita encounters a romantic interest who, though equally ignorant of their connected past, will lead to her learning about her origins. A very brief recap of The Winter’s Tale at the beginning of the book informs the reader, so that no knowledge of the original is necessary to follow or enjoy this retelling. Indeed, The Gap of Time will please readers who have never given Shakespeare a second glance, as well as his committed fans. Winterson has fashioned the ideal remake: paying respect to the original and faithfully following many plot points, as well as the general spirit, she simultaneously builds upon it, not only making Shakespeare’s work accessible to modern minds but providing a freshly felt and relevant emotional experience. Shakespeare’s sympathetic and intriguing plot involving several twists and changes of heart plays well with Winterson’s nuanced tone, while her characters are more multi-faceted than the originals. Leo is a deeply flawed man who nonetheless attracts the reader; Xeno is magnetic, beautiful and sensual; and MiMi is a woman of more complex feelings than the dignity Shakespeare gives Hermione. The next generation, Perdita and Zel, Xeno’s son, are appealing, with passions and interests of their own. It is Shep and Clo, though, Shakespeare’s nameless Shepherd and Clown, who get the most reworking, and to great advantage. Most of The Gap of Time takes place in London and New Bohemia, but also visits Paris, the Seine and, of course, the bookshop Shakespeare and Company. As realistic as these settings are, it is the gaming world invented by Leo and Xeno that is most imaginative and vibrant. Leo is obsessed with the scene in Superman: The Movie where Superman zips round the world and turns back time to save Lois Lane. Their game is creative, vividly rendered and evocative of Xeno’s disappointment in what his life has become, as well as Leo’s preoccupation with the idea of time’s malleability. It is a game filled with angels of death, and it is called The Gap of Time. As the title indicates, Winterson’s version of The Winter’s Tale plays with the concept of time even more than the original did, asking questions about what is changeable about our pasts and our futures. Leo wishes he could take back his madness and its consequences; Xeno wishes he’d handled it differently. This is a stirring tale filled with waste, simple mistakes and regrets. But as in the original, it also offers hope, young love and the possibility of new beginnings. In an unusual twist, Winterson herself steps forward in the final pages to speak in the first person about what she hopes for from this story–and then she steps back to allow her characters to finish it.